We have several lovely ways of finding new books. Sometimes we find books by idly browsing through library shelves, leafing through some pages and deciding it is good to be taken. Sometimes through the book columns in newspapers and magazines. Sometimes through book clubs or book groups that you are members of. Sometimes you are gifted books that you fall instantly in love with. This book was posted on the Instagram page of my friend @eternal_fernweh. I liked what she wrote about the book and bought it immediately on Amazon. It took me a while to get to it though. That is because this book triggered memories of other books that I had been searching for since long. I renewed my search and finally found them. So after I was done reading one of them, I turned to this. Like my aforementioned friend wrote I loved the way Maeve Binchy weaves everyday lives into lovely stories. 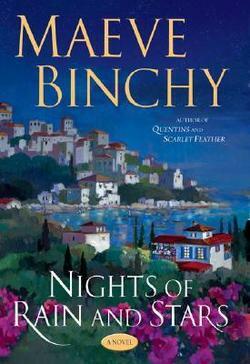 With this book, Binchy joins the ranks of authors on my list who I want to read again and again. She ranks right there with Ruskin Bond, Anne Tyler, Alexander McCall Smith. One one day Andreas spots a boat burning in the bay. He was busy in his restaurant high in the hill and not able to do much but look. He was joined by Thomas, Elsa, Fiona, Shane and David who had come to eat in his restaurant. Looking together at the tragic incident, too far to help, makes them feel a strange sort of solidarity. In this little Greek village of Aghia Anna they keep running into each other. This is not exactly by design, it is such a small place that they cannot help it, more than that, they want to meet each other again and again. They find themselves mentored by Vonni, an Irishwoman who has lived in this place for the past thirty years. They are all running away from some trouble back home. Thomas, from California, finds himself unable to share his son with his divorced wife and her new husband. Everyone can see that Shane is a prize cad except his loyal, kind and loving girlfriend Fiona. They have taken off from Dublin because, as Fiona endearingly believes, no one understands Shane. David, from London, is on the run from parents who expect him take over his father's business. Elsa is absconding from Germany. She is in love with her boss but finds the relationship stifling. They are here to hide, rest and heal. But what is Vonni's story? What made her leave Ireland and live here? There is much to discover in this lovely little book. Life in a tiny Greek village is so endearingly described that you wish you could pack your bags and go there immediately. I wish I could call the book charming. It is charming but it is much more than that. It is an insight into people. The problems that the characters face in this book (indeed in life as well) are not merely bad bits of luck doled out by fate. They are karma, results of the actions of these people. Their problems are not solved by fixing fate, but fixing themselves. They have learn to make amends, give up, return, accept offers of love and wait. It is a feel good book, but makes you think about how you have to work to make yourself feel good. Henry Rufous Treepie – Guest post by Karishma S.